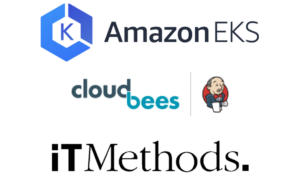 TORONTO, CANADA – Tuesday, June 12, 2018 – iTMethods, a CloudBees Managed Services Partner and AWS Advanced Consulting Partner and Managed Service Provider, recently announced the launch of CloudBees Jenkins Enterprise (CJE) on Amazon Elastic Container Service for Kubernetes (Amazon EKS) as a SaaS solution—empowering customers to take full advantage of all that CJE on Amazon EKS has to offer while eliminating the hassles associated with ongoing management. Amazon EKS enables enterprises to deploy, manage, and scale Kubernetes clusters on the AWS Cloud. Clusters can be provisioned and run across multiple availability zones, and Amazon EKS is Kubernetes conformant, meaning teams can continue to use all of the existing tools and plug-ins they rely on the most without issue. Since early in 2018, CloudBees has been working with the Amazon EKS team to deliver the general availability of CJE on Amazon EKS so that customers can operate scalable and flexible CJE clusters on Amazon EKS. As a CloudBees Managed Services Partner and AWS Advanced Consulting Partner and Managed Service Provider, iTMethods possesses unique expertise in migrating and managing CJE environments and Amazon EKS clusters. Its SaaS solution for CJE on Amazon EKS makes it easy for customers to install CJE on Amazon EKS without needing to architect, manage, or upgrade their own infrastructures while capitalizing on the AWS Cloud’s industry-leading security, elastic scalability, unparalleled resiliency, and more. iTMethods is the trusted partner for educational and financial institutions, media companies, professional and industry associations, software developers, online retailers, and other leading global organizations. We enable enterprise application teams to innovate, automate, and accelerate on the cloud. Our suite of products provides solutions for DevOps and cloud configuration challenges and our comprehensive monitoring means that all our customers can rest easy. Contact us today to learn more. As a tech-savvy Business Development professional, Andy has a strong passion for enabling success with innovative and best-of-breed technologies. Andy comes from a background in open-source and open platform technologies- with years of sales, marketing, and channel development experience. Today he strives to help unleash the full potential of teams by equipping them with the most collaborative tools on the market - without constraints.